A few weeks ago I attended the launch for Samsung’s new ST550 compact digital camera. Despite it’s flaws this camera will be popular with 24 hour party people and teenagers who love to take dozens of self portraits of themselves and their friends. I applaud Samsung’s attempt to innovate by offering a Dual LCD to make self portraits easier and a huge high resolution touchscreen with Apple iPhone-like gestures but i wouldn’t recommend this camera for the general population until they release a newer model which fixes numerous battery related issues. Dual LCD screens – Huge 3.5inch 1152K high resolution on the back of the camera enables you to easily compose and view photos you’ve taken. The smaller LCD on front of the camera with smile detection makes it easy to compose self portraits by holding your hand out with the camera in your hand and if you use the countdown timer it displays seconds left which is quite handy. Some interesting extra Settings – like the perfect portrait system and “Beauty” mode. I tried taking a self portrait of myself in the morning in normal AUTO mode and in comparison looking at the “Beauty” mode photo taken straight afterwards you could hardly tell I hadn’t shaved because the ST550 had retouched the photo to remove all face blemishes. Power Hungry – the ST550 camera is thin and has an LCD screen on the back and the front so there’s not much space for a battery in the camera body. I highly recommend you buy a spare battery because Samsung has used a 720mah lithium battery which struggles to last the whole day if you’re out and about taking photos. Unreliable Battery Meter – Another reason to keep an extra battery handy is because the battery meter on the LCD is unreliable, often pretending that the battery is almost flat but if you turn the camera on and off it goes back to displaying 2/3rds charged. Battery Charging Cable – The ST550 sold in stores only includes a USB charging cable. A standard powerpoint charger cable is available as an optional extra but it really should be standard. Low Light Photos – sometimes struggles to take sharp photos in dim lighting. More Buttons Needed – A lot of the physical buttons which are normally on the back of the camera have been integrated into the touchscreen in an attempt to cover the entire back of the camera with a screen. This can make changing settings slower and unnecessarily uses the LCD which drains battery life. From our experience with it, the ST550 is a ladies-oriented camera. Every time we whipped it out, our female friends loved the front LCD and how convenient it was for them to take self-portraits–all they had to do was tap and smile. In this sense, Samsung has met consumer needs with the dual display. Image quality and battery life issues aside, this point-and-shoot is one of the year’s more innovative products and should appeal to the trendy crowd. 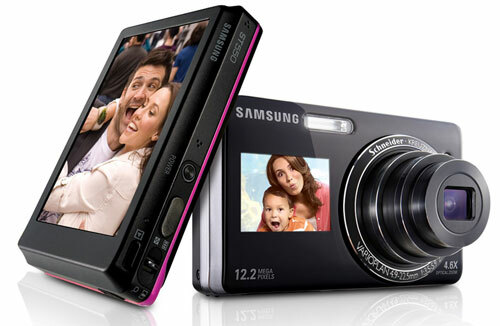 We like Samsung’s innovative addition of a second screen to the ST550, but this digital camera could be improved. Its battery life is poor, the menu system needs more information, and it could use some more manual controls. However, it can take some good photos and it performs adequately in dim lighting. At time of writing the Samsung ST550 retails for $350-$400 in Australia. I applaud Samsung’s attempt to innovate by offering a Dual LCD to make self portraits easier and a huge high resolution touchscreen with Apple iPhone-like gestures but i wouldn’t recommend this camera for the general population until they release a newer model which fixes numerous battery related issues. this camera meets all my needs. most of my friends want to get ST550 cuz of its dual LCD!. I love the LCD feature in front! 😀 And it looks really great! Is this still available on major shopping sites? I’m thinking of getting my girlfriend a gift. This is a great camera, I love it so much and all my friends are obsessed with it everytime I get it out however the lens is stuck out because it ran out of battery and I can’t find any way of fixing it over the internet, and after googling it appears to be a common fault.